Premium Leather grade deerskin palm and fingers. Wing Thumb. Fourchette fingers. Double stitched in high wear areas. 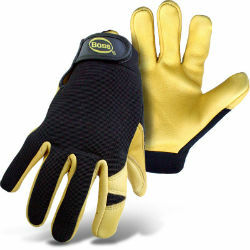 Elastic wrist with Adjustable hook and loop closure provides both a secure fit and easy removal. Exceptionally soft and pliable. Flexible nylon/spandex back.